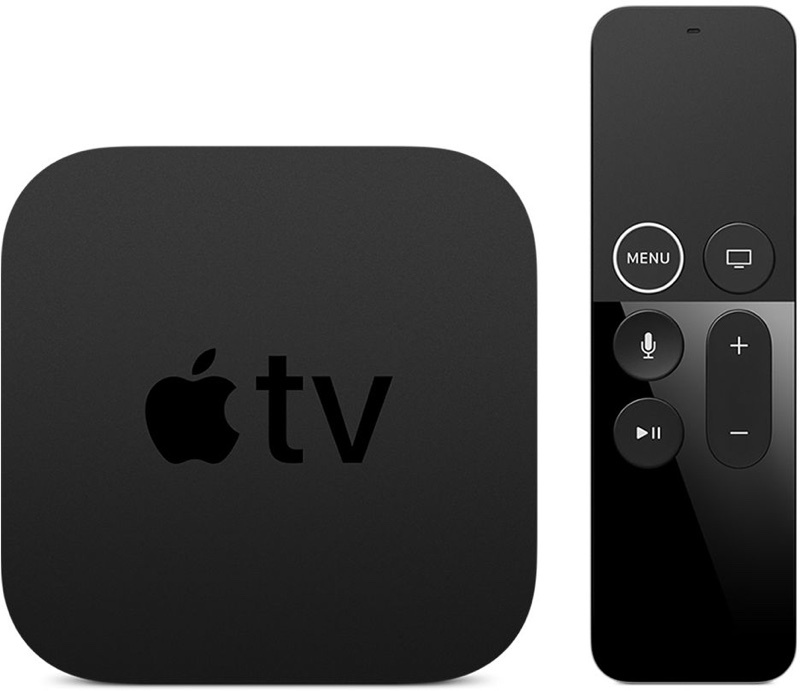 Apple's fifth-generation Apple TV, launched September 22, 2017. Subscribe for regular MacRumors news and future Apple TV info. In September of 2017, Apple introduced the Apple TV 4K, its first update to the set-top box since 2015. There are two key technologies at the heart of the new Apple TV: 4K and HDR, both of which bring cinematic quality to everything you watch on the new box. 4K support brings incredible detail to the Apple TV with four times the number of pixels as HD. 4K resolution is defined as 3840 x 2160, while HD is 1920 x 1080. While the 4K Apple TV offers improved resolution, its support for high dynamic range (HDR) is perhaps even more important. HDR brings richer, more vibrant colors and supports a wider range of colors. As iTunes chief Eddy Cue said on stage when introducing the Apple TV 4K, 4K is about the number of pixels, but HDR is about better pixels. Apple TV 4K supports both the HDR10 industry standard and Dolby Vision, a higher-quality version of HDR with even better color. The Apple TV 4K is meant to be paired with television that supports both 4K and HDR technology. Without an accompanying 4K television, the Apple TV 4K experience won't be the same. To get the most out of the Apple TV 4K, 4K content is also required. Apple is offering 4K movies through its iTunes Store, and 4K content is also available through Netflix, Amazon Prime Video, and other streaming services. YouTube isn't supported, though, as it uses an incompatible format. The tvOS interface has been redone in 4K with sharper text, and more vibrant images. Videos captured on the iPhone can be viewed in 4K on the Apple TV, and all of the Apple TV's animated video screensavers have been remastered in 4K. It supports apps like Apple Music and allows the Apple TV to serve as a HomeKit hub and an access point for controlling all of the connected devices in your home. Inside, the Apple TV 4K is equipped with an A10X Fusion chip, the same chip used in the 2017 iPad Pro models. The Apple TV is twice as fast when it comes to CPU performance and four times as fast when it comes to GPU performance, enabling a whole new class of apps and games. There have been no design changes to the Apple TV, so it continues to look like a simple black box that plugs into a television using an HDMI cable. There's a new Gigabit ethernet port included, and the USB-C port that was on the previous device has been removed. It ships with an included Siri Remote for control purposes, and the Siri Remote has seen some slight design tweaks. The Siri Remote is used for navigation, accessing the Siri personal assistant for voice searches, and as a game controller when playing games. The Apple TV 4K is available in 32 and 64GB capacities to store downloaded apps and content, with the 32GB model priced at $179 and the 64GB model priced at $199. The Apple TV 4K can be purchased from the Apple online store or from Apple retail stores around the world. It is also available from third-party retailers like Best Buy, Target, and Walmart. 32GB of storage space is priced at $179, while 64GB of storage is priced at $199. 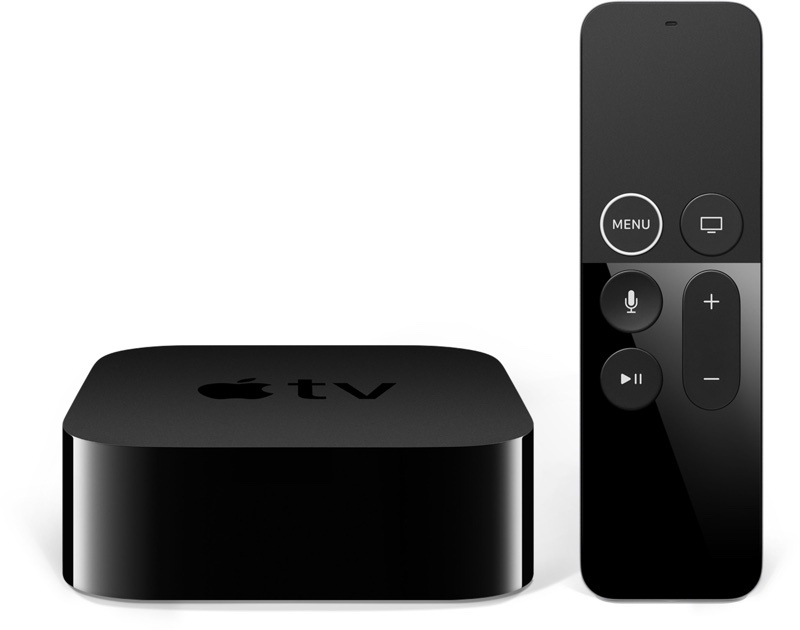 Apple is also continuing to sell the fourth-generation Apple TV, which does not support 4K. It is available for $149. Refurbished fourth and fifth-generation Apple TV models are available for purchase at a discount from Apple's online store for refurbished products. Refurbished Apple TV models are just like new models, come with the same warranty, and have been inspected and guaranteed by Apple. Like the fourth-generation Apple TV, the fifth-generation Apple TV 4K is a simple, unobtrusive black box that's about the size of the palm of your hand. There's an Apple TV logo at the top, and aside from that, the Apple TV is black on all sides and blends well with any home decor. It's small enough that it fits on any shelf or TV unit, taking up very little space. At the back of the Apple TV 4K, there's an HDMI 2.0a port, a Gigabit Ethernet port, and a port for the power cord. Compared to the previous-generation Apple TV, the new Apple TV gains the Gigabit Ethernet port (instead of 10/100) and loses a USB-C port that used to be available for things like downloading developer betas and taking Apple TV screenshots. 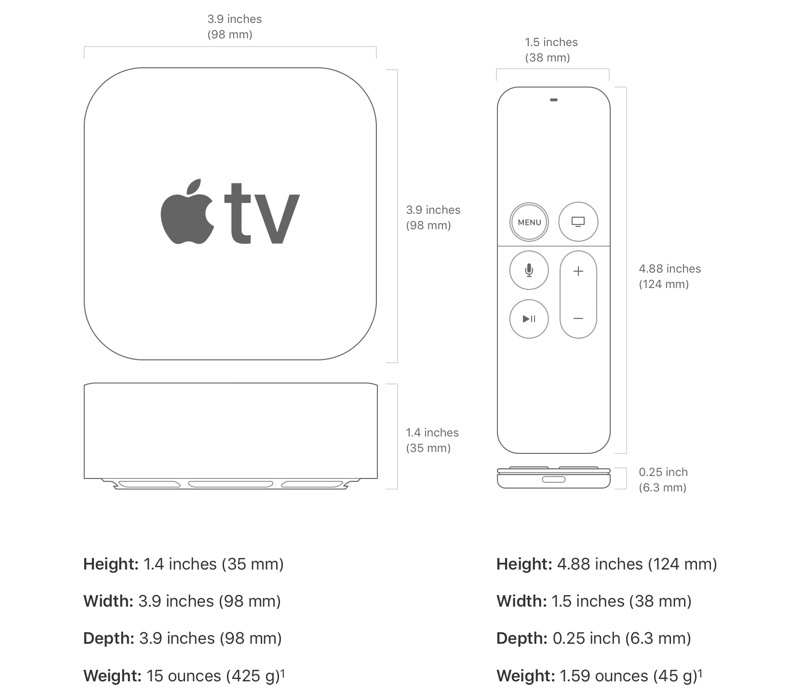 The Apple TV 4K measures in at 3.9 inches on each of its four sides, and it is 1.4 inches tall. It weighs just under a pound at 15 ounces. Inside, there's a new replaceable fan and a total of eight exhaust ports to support the improved processor. Inside the Apple TV, there's an A10X Fusion chip, which is the same chip used in the 2017 iPad Pro models. The A10X Fusion is a much faster chip than the chip that was available in the fourth-generation Apple TV, with 2x the CPU performance and 4x the GPU performance. The Apple TV also has 3GB RAM to support 4K. 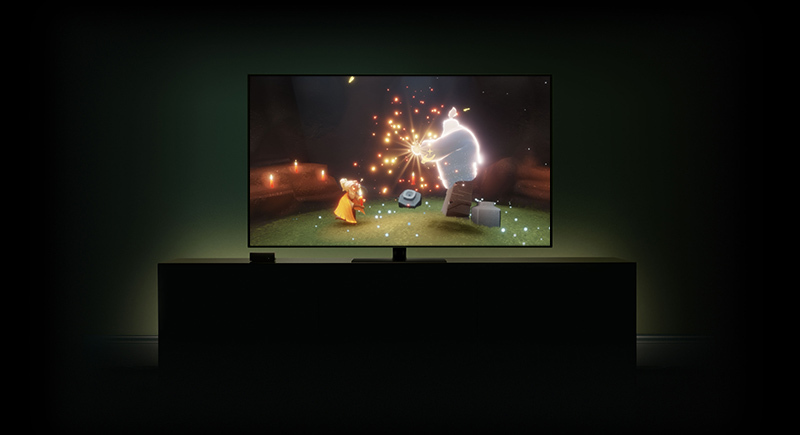 With the new chip, the Apple TV 4K can run much more system intensive games and apps, allowing for games that can take advantage of the 4K display. For storing games and downloaded content, the Apple TV is available in either 32 or 64GB capacities. Most people do not need more than 32GB of storage, but those who plan to download many apps or games may want to go with 64GB. For connectivity, the Apple TV 4K supports simultaneous dual band (2.4GHz and 5GHz) 802.11ac Wi-Fi with MIMO and Bluetooth 5.0. 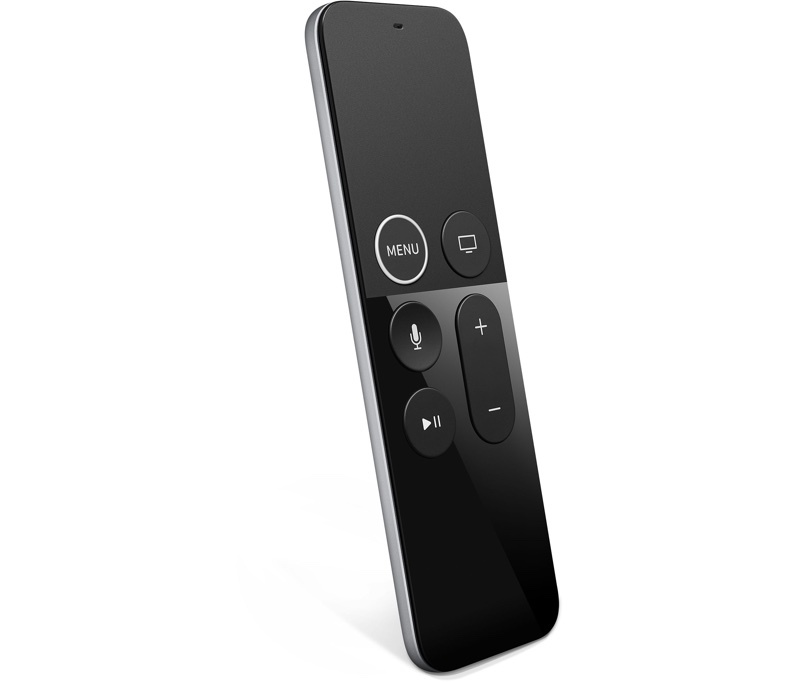 Sold alongside the Apple TV as an input method, the rectangular Siri Remote features a built in touch surface used as a general "select" button and touch pad, a Menu button, a Home button, a Siri button for activating Siri, play/pause buttons, and standard volume controls. The Siri Remote connects to the Apple TV using a Bluetooth 4.0 connection, and can also control elements of a TV set like Bluetooth using an IR transmitter. The touch surface on the remote is used as a touch-based navigation method, allowing users to swipe through the App Store, the Home screen, and content within apps, as well as fast forward, rewind, and perform other TV control gestures. It takes up about one-third of the remote. When held down, the Siri button on the remote activates Siri, and Siri on Apple TV works much like Siri on iPhone. There are two microphones built into the remote so Siri commands can be heard, with Siri relaying information back on the television screen. The 2017 Siri Remote has been slightly redesigned. There's a new white ridge around the Home button, which makes it easier to determine which end of the remote is in your hand without needing to look down at it. At the bottom of the Siri Remote, there's a Lightning port that's used for charging with a standard Lightning cable. The Siri Remote needs to be recharged every few months. Because there's an accelerometer and a gyroscope built into the Siri Remote, it can be used as a controller for many Apple TV games. The Siri Remote is only available in a handful of countries: Australia, Canada, France, Germany, Japan, Spain, the UK, and the United States. In other countries, there is no built-in Siri support, and the remote is called "Apple TV Remote." Instead of bringing up Siri, the microphone button on these remotes brings up an on-screen search app. Along with the physical Siri Remote, the Apple TV can be controlled using a Remote app that's available in the App Store for the iPhone, iPad, and Apple Watch. 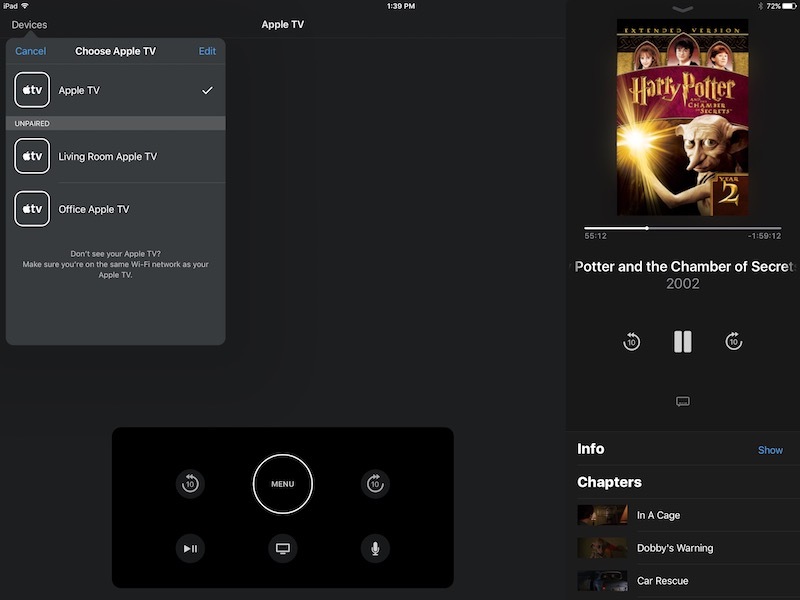 The Remote app has a layout that's similar to the Siri Remote, offering virtual controls for navigating the Apple TV interface, accessing Siri, and controlling volume. On the iPad, details about what's playing are also shown in the app. 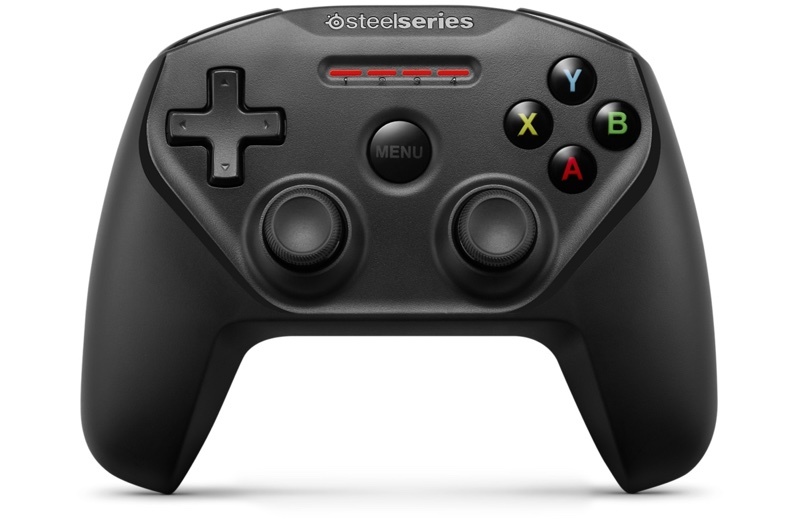 The Apple TV also supports third-party Bluetooth gaming controllers that can be used in lieu of the Siri Remote when playing a game from the tvOS App Store, and a Bluetooth keyboard can be connected. 4K delivers four times more pixels than standard HD (3840 x 2160 vs. 1920 x 1080) and paired with HDR support, the Apple TV 4K offers brighter, more realistic colors along with much greater detail. 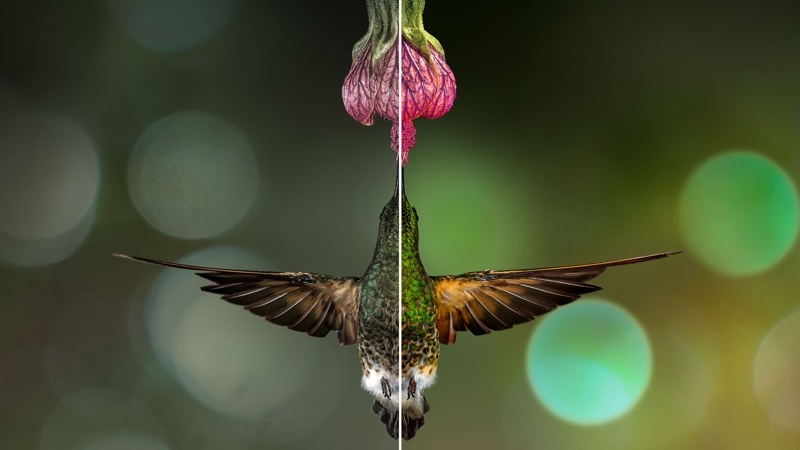 Both HDR10 and Dolby Vision are supported, with the latter being the preferred HDR standard because it offers a wider range of colors. HDR and 4K are both noticeable upgrades over 1080p high definition, especially so when it comes to HDR. 4K (also called ultra high resolution) offers more pixels and with HDR, you get deeper reds, more vivid greens, brighter blues, clearer yellows, and more contrast and color range in scenes with both light and dark elements. 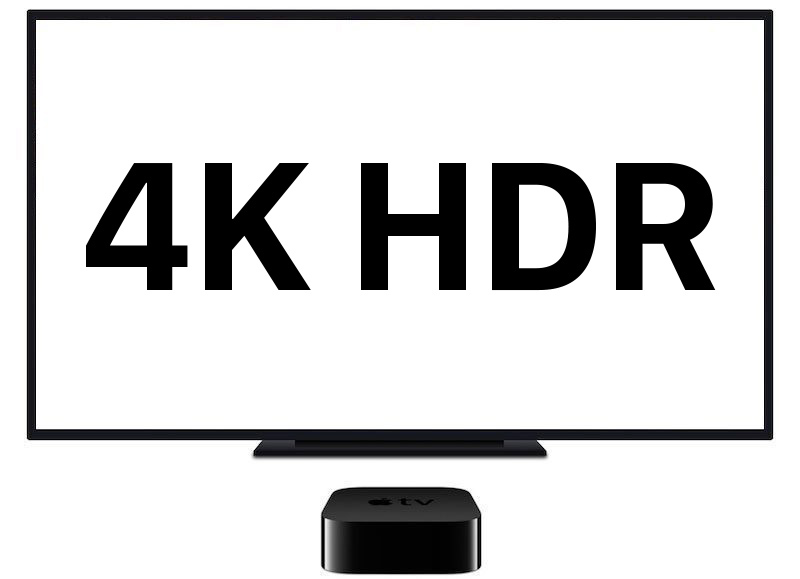 The Apple TV 4K requires a compatible 4K television to properly display content at a 4K resolution, and you also need to supply an HDMI cable for connecting the television to the Apple TV. Apple recommends a cable compatible with HDMI and Dolby Vision, and more specifically, an HDMI cable that has a Compatible Dolby Vision mark. For the best experience, a TV that supports 4K and HDR at 60Hz (50Hz in Europe) is required, but it works with 4K Standard Dynamic Range, 4K High Dynamic Range, and 4K Dolby Vision. The Apple TV 4K also works with a TV that has a 30Hz HDR refresh rate (25Hz in Europe) but lower refresh rates can result in choppy video, so Apple's recommendation for TVs that don't support HDR at 60Hz is to lower resolution to 1080p at 60Hz and letting the television upscale to 4K. To stream content in 4K from iTunes, Netflix, or another source, Apple recommends that customers have a minimum connection speed of 25Mb/s. If an internet connection isn't fast enough for transferring 4K content, Apple downscales the video quality. Apple does not allow users to download 4K content from iTunes, with 4K content limited to streaming. The Apple TV 4K supports H.264, HEVC (H.265), HEVC Dolby Vision, and MPEG-4. As for photos, it can display images in the following formats: HEIF, JPEG, GIF, and TIFF. Supported audio formats include HE-AAC, AAC (320Kb/s max), protected AAC, MP3 (320Kb/s max), MP3 VBR, Apple Lossless, FLAC, AIFF, WAV, Dolby Digital 5.1, Dolby Digital Plus 7.1 surround sound, and Dolby Atmos. The Apple TV 4K can play 4K content from a range of sources. Apple has made deals with movie studios to offer a wide selection of 4K movie titles in iTunes, which are available for the same price as HD movies. Apps like Netflix and Amazon Prime Video (released in late 2017) also offer content that can be streamed in 4K. YouTube offers 4K content but it is not compatible with the 4K Apple TV at this time as Apple does not support the VP9 format YouTube uses for 4K. The Apple TV 4K is designed for 4K content and the picture looks the best when streaming or playing 4K resolution TV and movies, but non 4K HDR content is compatible. With non-HDR and lower resolution movies and TV shows, the Apple TV upscales the content. Regardless of your setup and the content you're watching, Apple TV 4K always chooses the settings that are going to give you the best picture. Apple has been working with some cable providers to offer the Apple TV as a replacement for a traditional cable box. CANAL+ in France, Salt in Switzerland, and DirecTV in the US all allow customers to replace their cable boxes with Apple TV, gaining all of the same functionality through dedicated apps. In 2019, Charter Communications began offering the Apple TV 4K to its customers, with Charter users able to access all of their live channels and on-demand programs through a Spectrum TV app on Apple TV 4K, iPhone, and iPad. Verizon also offers the Apple TV 4K for free to customers who subscribe to its 5G broadband service, available Indianapolis, Houston, Los Angeles, and San Francisco. 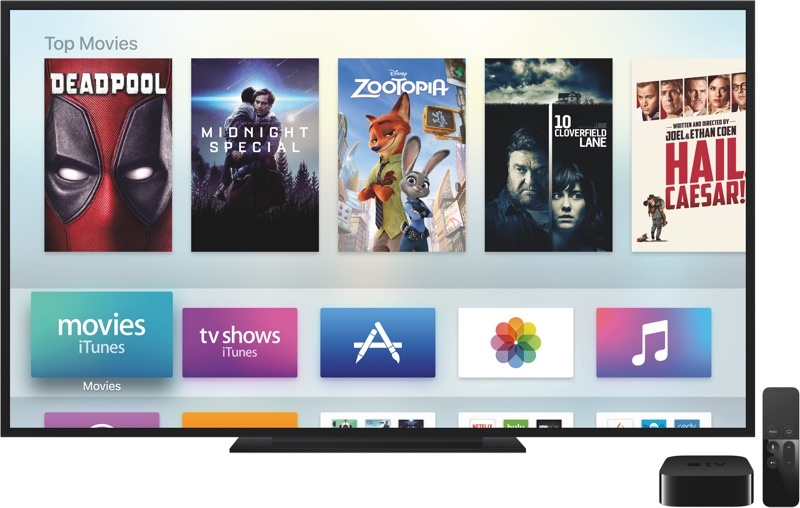 The fourth and fifth-generation Apple TVs run an operating system called tvOS, which was built to offer up a simple, easy-to-navigate television watching experience. tvOS puts content front and center with an app-centric design that includes an App Store, Siri integration, a dedicated TV app for highlighting content from a range of different apps, HomeKit support, and more. For more on tvOS, make sure to check out our dedicated tvOS roundup, which includes details on the latest version of the operating system. Apple in 2019 took a greater interest in services, unveiling new plans for television-related content that will ultimately bring in more entertainment revenue. 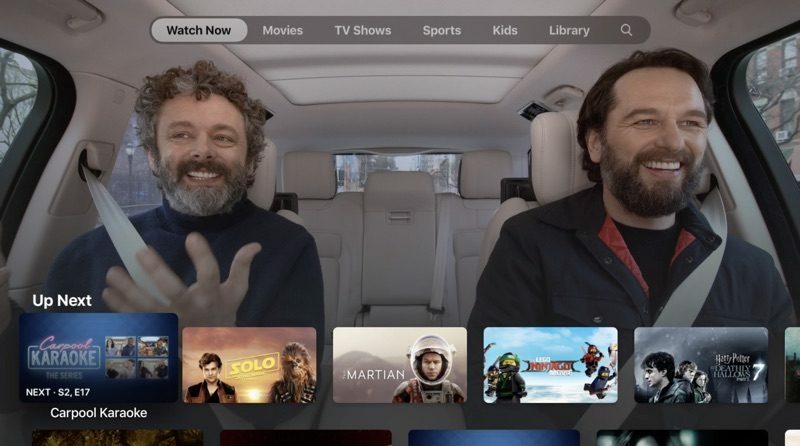 Apple revamped the TV app available in tvOS and iOS, inked deals with third-party content providers to bolster TV app offerings, and announced a new service that will house original TV shows and movies. Apple in iOS 12.3 and tvOS 12.3 (currently in beta) overhauled the TV app, introducing a cleaner, more streamlined look for the app along with better content recommendation algorithms. 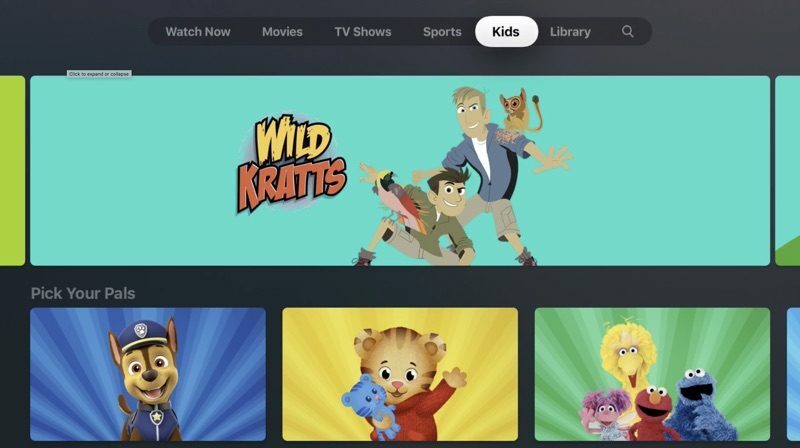 The overall app interface has been improved with sections for Movies, TV Shows, Sports, and Kids content at the top on both Apple TV and iPhone, while Library houses a list of content that you've purchased from iTunes. "Watch Now" with its "Up Next" function is still front and center in the TV app, but there's a new machine learning-based recommendation engine that surfaces personalized content suggestions for you based on what you like to watch. Up Next will continue to keep track of what you're watching so you'll never forget what episode of a TV show you're on or where you left off watching a movie, while the new "For You" recommendation feature draws in content from more than 150 streaming apps, including Hulu, Amazon Prime, DirecTV Now, PlayStation Vue, and more. In addition to the "For You" section, the TV app also offers "Because you watched..." recommendations much like Netflix. The TV app includes a new "Channels" section, which is a key new services feature that Apple added with the revamp. Channels are subscription services that you can sign up for and watch within the TV app without having to open up another app. Some of the new Channels that are supported include CBS All Access, Starz, Showtime, HBO, Nickelodeon, Mubi, The History Channel Vault, and Comedy Central Now. 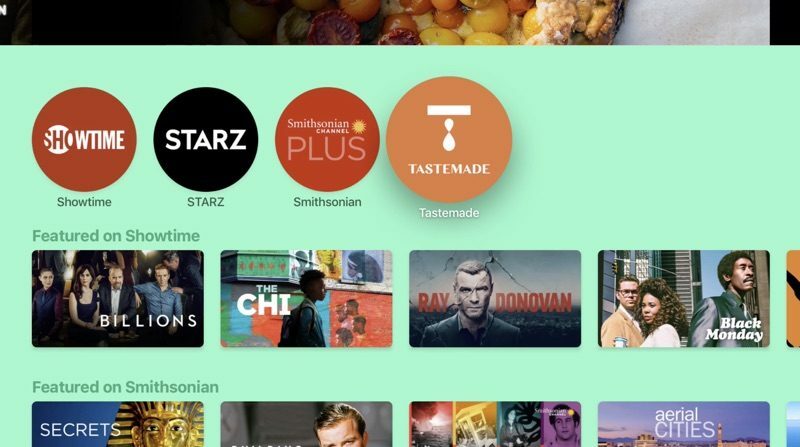 During the beta, though, users can subscribe to Showtime, Starz, Smithsonian, and Tastemade. The TV app is available on iPhones, iPads, and the Apple TV at the current time, but in the fall, Apple is expanding it to the Mac. Apple is also bringing the Apple TV app to Roku, Amazon Fire TV, and several smart TV offerings from companies that include Samsung, Sony, LG, and Vizio. Apple TV+ is Apple's new streaming television service, coming this fall. Apple TV+ will offer all of Apple's original TV shows and movies that are in development. Little is known about Apple TV+ this time, but it will be available on all devices where the TV app is available when it launches. Apple has not yet announced pricing for the service, but it is ad free and shows will be available to watch on demand. For more information on Apple TV+, make sure to check out our Apple TV+ guide. Apple has more than two dozen original television shows and movies in the works, many with high-profile actors, actresses, directors, and producers. We have a full guide with a list of all of the TV and movie projects Apple has in development available here. For a long time, there were a slew of rumors suggesting Apple planned to debut a full high-definition television set, spurred by Walter Isaacson's Steve Jobs biography, which suggested Jobs wanted to revolutionize the television industry much like he transformed computers, music players, and phones. "I finally cracked it," Jobs was quoted as saying. Rumors reached a fever pitch over the next few years, and in 2012, news hit suggesting multiple television prototypes were in testing. Rumor after rumor continued until 2015, with some even ranging into the fantastical, but no television set ever appeared. As it turns out, Apple's testing did not result in a product worth manufacturing, and as of 2014, Apple had ceased its work on developing a full-blown high-resolution television set, putting the project on ice. 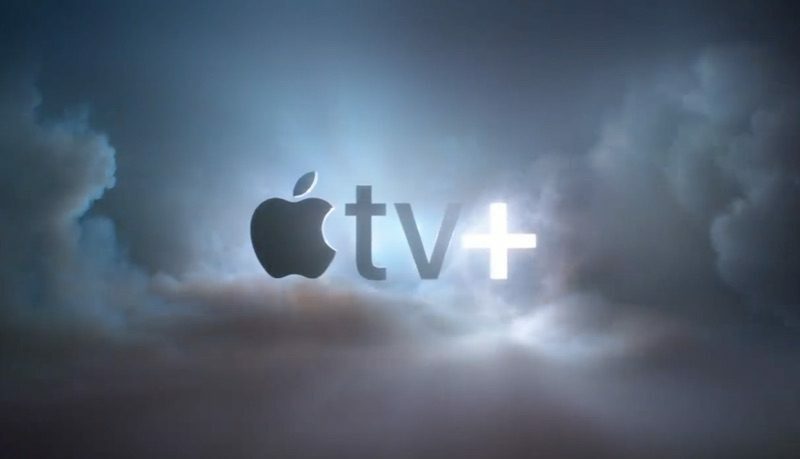 Apple was reportedly unable to come up with a feature set compelling enough to warrant entry into the highly competitive television market, despite years of research. It is not clear if Apple will revisit its television set project in the future, but it is always possible Apple will reevaluate its plans as technology improves. For time being, though, Apple is focusing its resources on improving the Apple TV set-top box, the TV app, the tvOS App Store, and Apple TV+, revolutionizing television through the integration of content, services, and interface without having to develop an actual television set and enter a brutally competitive market. While the Apple TV roundup pertains to the fourth and fifth-generation Apple TVs that have been available since 2015, some people continue to use older versions of the Apple TV. First, second, and third-generation Apple TVs run a different operating system and do not have access to a dedicated App Store with games, entertainment, and other apps. Instead, these Apple TVs use different channels offered by various content providers, along with several Apple apps like iTunes. Older Apple TVs continue to function, but are not updated as often as the fourth and fifth-generation Apple TV models, and do not have the same range of content available. As of May 25, 2018, security changes prevent the first-generation Apple TV from accessing the iTunes Store. Second-generation Apple TV models and later continue to work with the iTunes Store. Apple is considering creating a lower-cost Apple TV dongle similar to the Amazon Fire Stick or Google Chromecast. The device would be available at a lower price than the current Apple TV set-top boxes, and it would be able to be plugged into the back of a television set.